Making a career change can be a painful process for some job hunters and career changers who feels that there is much more life has to offer “on the other side”. I was in the midst of a huge career change back in 2010 when I’ve decided that I should leave the Republic of Singapore Navy (RSN) to join the civilian sectors to experience something different. I am thankful for the support of my family and loved ones, because leaving this culture, the Navy (or military) culture is difficult for most service personnel – you are not just leaving a job, but you are leaving a whole lifestyle. Resources are abundant on the web to prepare professionals for the transition. You just need to know where to find them. There is also a roadmap to guide you! For me, it was a totally different world when I first transited! In the RSN, we were naturally better disciplined, we had early opportunities to take management and leadership roles, and we are able to develop a diversity of knowledge and skills through the various opportunities presented to us throughout our career. In the private sector, however, you will only be given the opportunities to hone your skills if you have already proven yourself (in most cases). In some cases you might even feel that you are unable to see the light at the end of the tunnel! It is important for anyone when transitioning from one career to another to imagine yourself as someone who already is working on the new job. Many professionals aren’t prepared to make this mental shift. Career changes like this can stress a family because these transitions often involve physical moves, loss of support network, potential income reduction (for retiring and non-retiring individuals), change of work priorities and many other issues (usually monetary). To me, besides being financially and mentally prepared (this includes a discussion with your family and loved ones), you will need to be “operationally-ready” as well. Start your job search early – Even if you are one or two years from leaving the service, start reading up on companies in which you have an interest in. Conduct some research on their competitors, their associates, and affiliations to include in your network of contacts as well. Develop a solid network – Develop a network through your current colleagues, suppliers, and peer-to-peer engagements. Your network is something you should have and maintain throughout your career anyway. This networking effort builds knowledge of the job market, puts you in the limelight, and gives you an understanding of industry. Embrace Lifelong Learning – While you are still in the current job, do not hesitate to attend any additional training and experience that will help you with your planned job. No harm going for that additional leadership talk. Find a career you are passionate about – Be honest with yourself and spend some time thinking about what you are ‘passionate’ about. I have a friend in the military who told me that he can’t find any career paths he is passionate about outside of the military. Then my advice is to just remain in the service. Identify transferable skills – It is important to be aware of the transferable skills and how these skills are being optimised in the new job. Think of how valuable your supervisory, training or technical skills are to that potential employers. A military officer, for example, may have experience managing and motivating groups of servicemen, handling complicated logistical situations and developing and executing plans and strategies (i.e. a typical executive role). Identify powerful soft skills – Identify skills like the ability to organize information, analyze situations, lead a team, time manage and establish effective communication and resolve conflict. To me, the number one skill set that the Singapore Navy bestowed me with is the ability to effectively manage, appraise, monitor and professionally develop my men when in service. Research, research, research – Make use of the web. Use it effectively and your chances of finding the ideal civilian career are greatly increased. The Internet can be a powerful tool in your job search. You can get tips on job search strategies, effective resume writing, networking techniques, interviewing skills, and informational interviewing. You can also post your resume on the web for interested employers and recruiting specialists. Build your personal branding – On top of your offline personal branding, make use of various social media platforms such as LinkedIn, Google+, Twitter, Facebook or even Pinterest and Instagram to establish your online branding. You have options. Find out what social network resonates with you (try biipmi, the online employability platform my company developed!). Use them to establish your presence in the civilian world. Having a personal brand is important and can be especially beneficial for professionals like you. It helps build awareness, community and authority in your industry around your name or brand, in terms of your unique combination of skills, experience and background. Social media is the perfect platform to build and amplify your unique identity and it becomes an attractive proposition with its potential to yield powerful and positive results. Build your own online platform such as a blog or website that you own, then amplify your content and engage with your audience on social networks. How to expect employers to hire you when they don’t know you? And did I mention it is all FREE? Accept that the economy has a say – Accept the fact that some of the career decisions that you eventually make may end up based partially on the market demands as you are near your transition. A job very much in high demand now might even be around in 2-3 years time. Read about my article on “How to be Prepared for the Future Workforce” to find out more about future skills. 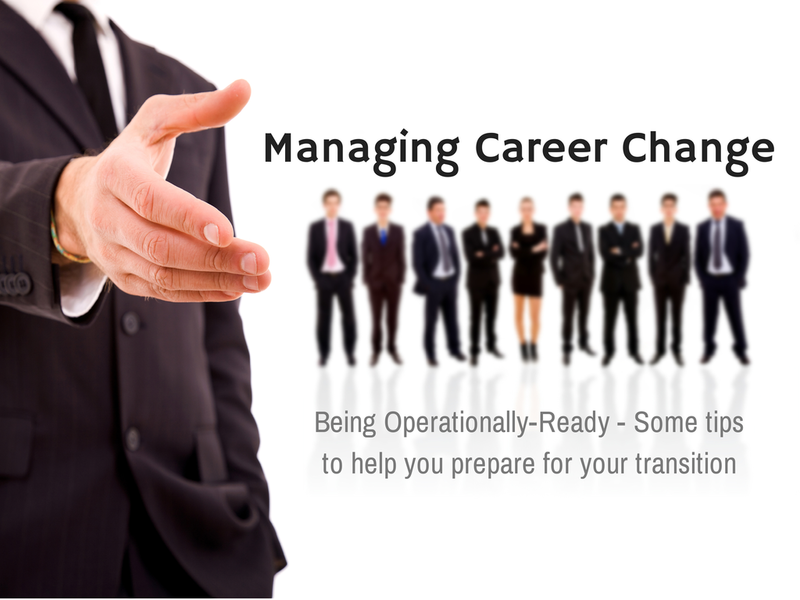 In a nutshell, any career transitions can be difficult. Are you operationally-ready before you take the dive? This article first appeared in LinkedIn, a publishing platform for professionals worldwide and was contextualised for a broader scope of career transition.